A double deck of regular playing cards with the Periodic Table Elements. 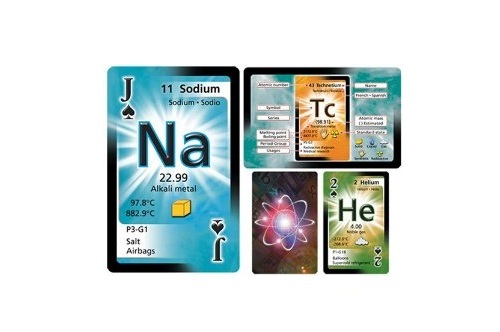 Each card features one element, it has the atomic number, name of the element in English, French and Spanish, the mass, the category, melting and boiling points, period and group, natural state and common usages. A great learning aid. Price: $15.99 & eligible for FREE Super Saver Shipping on orders over $25.